Dark Chocolate Sea Salt Almonds! How To Make Chocolate Cups! Death By Chocolate Icebox Cake! St. Patrick's Day Oreo Pops! What is a chocolate tempering machine? What are the chocolate tempering temperatures? Happy National Cocoa Day! This is totally easy. I promise. 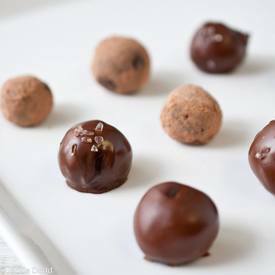 It sounds really hard, making truffles from scratch. And really, that’s the best part. It sounds hard, and impressive, and it has beer in it, which makes you a Christmas Party Superhero, but it’s really easy. And since so few people have ever made truffles from scratch, they won’t even know how easy it was. Please post your comment below. Copyright © 2019 Chocolate Tempering Machines .com. All Rights Reserved.